To be the one who has to give advice? To be the strong one? To be the one whose phone rings all day everyday? Sometimes, sometimes, doesn’t the light seem to move so far away? you help me but who do you cry to? To be the one who gathers everybody’s tears? All’s quiet on the inner city front. For Bruce Cockburn, the months leading up to Inner City Front’s 1981 release had been fraught with change: his marriage of 10 years dissolved, leading him to switch from country to city life. Taking an an apartment in downtown Toronto, he assembled a band of crack musicians and adopted a more rugged, urban sound. Gone were most traces of the Gentle Folkie of the late 1960s and even the Mystic Christian of the 70’s. In their place was Bruce Cockburn of the 80s – highly politicized and sporting an electric guitar. 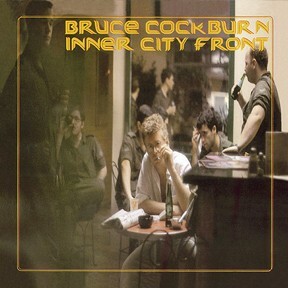 19 November 2002 – From Rounder Records: Bruce Cockburn self-produced the nine tracks of rock, reggae, jazz and folk-fusions that form “Inner City Front”, originally released in 1981. Now re-mastered with two bonus tracks, it could be called the artist’s Toronto album since it reflects so strongly his move to the city and his embrace of both its attractions and tensions. “Inner City Front” contains some of the most carefree love songs of his career, including a B-52s-like rocker “Wanna Go Walking,” the flute-filled “And We Dance,” and the infectious “Coldest Night of the Year,” which finally joins the album for which it was originally intended. 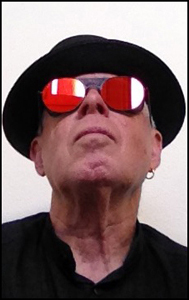 “The Light Goes On Forever” is also included as a bonus track, having been previously available only as a B-side. Produced by Bruce Cockburn.